Golf is one of the most popular and widely played sports in the world today, and whether you have been playing for years or have never touched a club, buying golf equipment can be a daunting task. This golf club buying guide will help you put together the perfect set for yourself and give you tips to make the process fun and painless. Identify your ability level and/or handicap. If you are unsure of your handicap or ability, you can contact one of our PGA Professionals at pga@globalgolf.com or call them at 919-573-8657. Starting with the above clubs as your baseline set, you can then start selecting equipment based on your ability level. Though the clubs above are listed as a baseline, there are an infinite number of possibilities to create a set of clubs. It all depends on your preferences and how well you hit each different club. Long irons can be replaced with hybrids or woods. Irons can even replace woods. And any number of wedges can be chosen to be put into your bag. These are just a few ways to switch up what is in your bag, but 14 clubs is the limit by rule. See what you like best or what benefits your game best. The possibilities are endless, but by starting with this basic set you can better determine what is going to be the perfect set for you. 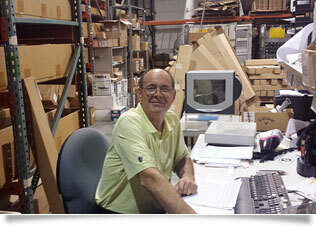 The next part of shopping for clubs can get quite confusing, but we are here to make this process much easier. You need to understand not only the terminology of the components, but how those components translate to your game. Now that you have an idea of what a basic set is, we can delve a little deeper into exactly what you are looking at when trying to buy golf clubs. There are four major categories of golf clubs: woods, irons, wedges, and putters. All of these club types have several major components that are common to all golf clubs on the market today. Grip - The grip is a rubber cover that goes over the last eight or so inches of the shaft and allows you to hold (grip) onto the club. You will see clubs identified as having Standard, Midsize and Oversize/Jumbo grips. Grips can be selected based on the size of the player's hand. There are many different designs, textures and colors that can be found, but all serve the same purpose—to grip the club effectively. Shaft - The grip is situated atop the shaft, which is the next major component of any golf club. This component is a cylindrical piece of graphite or metal and its length depends on the club in which it is installed. This component comes in different flexes, which means a club's shaft can be stiffer or more flexible depending on its flex. Your clubhead speed is the biggest factor in determining which flex is best for your swing. The stiffness levels are each labeled by a different letter: "L" stands for ladies, "A" or "M" stands for amateur or senior, "R" stands for regular, "S" stands for stiff, and "X" stands for extra stiff. The most common flex for men is "R" and for women is "L." If you're unsure what flex is right for your game, contact one of our PGA Professionals at pga@globalgolf.com or call them at 919-573-8657. Hosel - The next component is the hosel, which connects the shaft to the clubhead and controls the lie angle of the club. 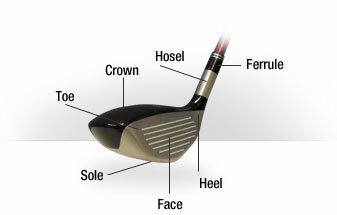 The lie angle is a measured angle between the sole of the club head and the shaft. Players sometimes need their lie angles adjusted based on their height, arm length or swing style. If you need the shaft bent to increase that angle then you have an "upright" lie and if you decrease that angle you have a "flat" lie. An adjustable hosel performs the same job as the hosel—it connects the shaft to the clubhead. 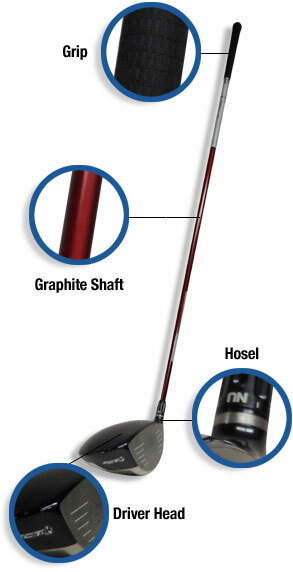 However, an adjustable hosel allows players to adjust the loft and lie angle of their club. Adjustable hosels have been in production only recently (since 2009) and typically are only found in drivers, fairway woods, and hybrids. An adjustable hosel allows players to remove the shaft from the clubhead, select a different loft and lie angle on the hosel, and reinstall the shaft with the simple turn of a wrench. (Wrenches are available with each adjustable hosel.) This can be very beneficial, as it allows the club to be fine-tuned for an individual player's nuanced swing characteristics and personal preferences. Clubhead - The final component is the clubhead. This is the part of the club that actually hits the ball. It controls the height and ultimately the distance that the ball will travel. The clubhead is the main feature of any club and is typically the first thing a player will decide upon before any other attribute or component. Clubheads are designed with each manufacturer's specific technology attributes and are geared towards a specific player's ability, but they all perform the same job—strike the golf and propel it forward. All of these components relate directly to your success on the golf course. If unsure what is right for your game, contact one of our PGA Professionals at pga@globalgolf.com or call them at 919-573-8657. These clubs were known as "woods" for much of the history of golf, mainly because they used to be made of wood. Drivers (along with fairway woods) are still traditionally referred to as "woods," even though they are almost universally produced now using steel, titanium, or other modern materials. The "1 wood", more commonly known as the driver, has the largest clubhead in the bag. Drivers are long distance clubs typically used off the tee box for your first shot on a Par 4 or Par 5. They are designed mainly with graphite shafts, and the driver will almost always be the longest club in your bag. 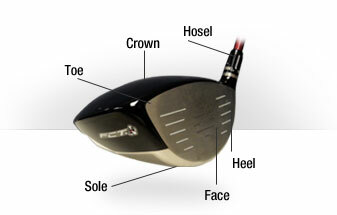 The face of the driver typically is the largest hitting area of any other club as well. There are also different clubhead sizes that can be selected in drivers. By rule, the largest that a driver clubhead can be is 460cc (cubic centimeters), which in turn makes the 460cc head the most popular size of driver clubhead. You can find drivers in smaller sizes, such as 440cc or less, but these tend to be used by more skilled players. A general rule of thumb is the higher the cc number of the head, the more forgiving it can be on off-center shots. The advantage of having a lower cc clubhead is the added workability and shot-making ability that the head offers, which is why smaller clubheads appeal to players with advanced skills. The fairway woods are also included in the wood category. You can also refer to them as "Fairway Metals" or "Metal Woods". Fairway woods include (but are not limited to) 3-, 5-, and 7-wood clubs. The higher the number gets, the greater the loft of the clubhead is and therefore the higher and shorter the shot will travel. Fairway woods also come with graphite shafts most of the time, although occasionally they are offered with steel shafts. The clubheads of most woods—though they do decrease in size—look relatively similar to a driver, with a bulbous shaped head and a flat face on one side which strikes the ball. The fairway woods are mainly used on longer fairway shots, short Par 4 tee shots, and long Par 3 tee shots. Players who struggle hitting their drivers may sometimes use a fairway wood to tee off instead of their driver. They do this because the added loft of the fairway wood assists in them in ensuring their shot travels straighter. As the name suggests, the hybrid club is a cross between a wood and an iron. While hybrids have a similar shape to a wood and carry the advantage of being easier to hit, they also have the loft and length of an iron, therefore they will travel the distance of that iron. Many people replace their long irons, such as their 3- and 4-irons, with hybrids in order to increase the ease of playability and forgiveness on off-center hits. Though 3- and 4-irons are the most commonly replaced irons, there are many other irons that can be replaced by hybrids for ease of hitting. Irons are used on every hole and cover everything from short & mid-range shots to long range shots from the tee. Irons generally come in sets that include 6-8 individual irons. The typical iron set consists of (but is not limited to) the 3-, 4-, 5-, 6-, 7-, 8-, and 9-irons, along with a Pitching Wedge and/or Gap Wedge (sometimes called an Approach Wedge). When shopping for an iron set, you will see them listed per their set make-up (i.e. "3-PW", "4-PW, AW" or "5-PW, AW"). You should know that this shorthand indicates that all clubs in between are included, so a 3-PW set would include the 3- through 9-irons as well as a pitching wedge. Iron sets can come with steel or graphite shafts. If you're unsure of what shaft material is right for your game, contact one of our PGA Professionals at pga@globalgolf.com or call them at 919-573-8657. 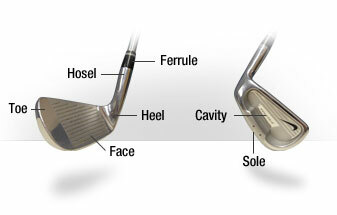 Clubheads on irons have deeper grooves extending across the face from toe to heel and running parallel from top bottom. These grooves help generate the spin on the golf ball that's necessary to control your shot. The number of the club indicates how high and far the shot will travel. The higher the number, the greater the angle of loft is. When the loft is very high, the ball will fly higher but for a shorter distance. Clubheads on irons are also much thinner in depth than woods or hybrids and give you an improvement in accuracy. The closer you get to the hole, the more accurate you want your shots to become, and the thinner, smaller heads of irons help facilitate this accuracy. Max Game Improvement Irons - This iron type is a Cavity Back, so-called because of the large "cavity" or hollow portion in the back of the clubhead. The sole and toplines are enlarged on Max Game Improvement irons compared to blades or other iron head designs meant for more skilled players. The combination of the cavity back and the larger sole and topeline help to make the clubs more forgiving and easier to hit. Beginning golfers or those with higher handicaps (25+) would benefit from this iron type. Game Improvement Irons - There are different grades of cavity back, with the larger cavities being easier to hit and the smaller cavities being less forgiving. Game Improvement Irons have this smaller cavity back, but the sole and toplines are thinner and more compact. These irons fit a wide range of skill levels (5-25 handicap) and are the most popular sets. Player's Irons – Player's irons are generally a Cavity Muscle Back (CMB) or Muscle Back (MB). They are also known as a "blade". These types of irons are used by professionals and other highly-skilled golfers, even though many professionals are now switching over to cavity backs. Blades have a flat back with no cavity, making them less forgiving. Though they are harder to hit, when hit properly, they produce a better feeling than a cavity back. Wedges are very closely related to irons in that they both have the same look and build. The difference comes in the lofts of the clubs. Wedges have a higher degree of loft and are designed for very high accuracy and more spin than regular irons. Wedges also have "bounce". 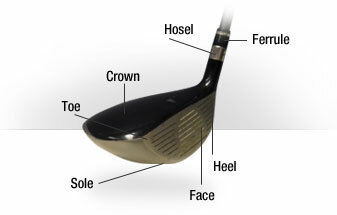 Bounce is the angle from the leading edge of the clubface to the bottom of the sole. The higher this angle is, the easier the club will bounce off of the ground (rather than dig into it), which is good for chip shots around the green. There are also many different kinds of wedges to choose from. 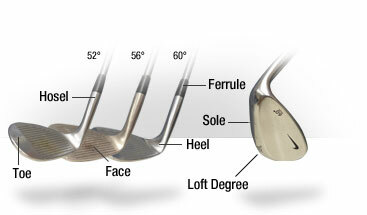 The most common of these are the gap wedge, the sand wedge, and the lob wedge. The gap wedge (also known as an approach wedge) bridges the gap of distance between the pitching wedge and the sand wedge that can commonly be an awkward distance to attempt to hit without this club. This club allows for more distance than the other wedges but excellent accuracy as well. The sand wedge, debatably the most common wedge, is used for most sand bunker shots as well as many chips around the green in which you would like to get the ball up in the air and spin it once it hits the green. Though not a particularly long distance club, the sand wedge can be a very useful tool. The lob wedge is the last of the most common wedges and is used for short distance shots that will travel very high and spin a lot. This club provides the golfer with the ability to manipulate the ball around the greens with shots that stop quickly or high shots that spin back to the hole. A commonly asked question about wedges is: "Where does the pitching wedge go in the wedge category?" The truth is that the pitching wedge is generally placed in the iron category because it is usually sold with an iron set and not separately like many wedges are. Therefore the pitching wedge is not generally discussed among the other wedges, despite its name. The putter is debatably the most important club in any bag. This club is typically fitted with a steel shaft and sometimes with a flat or squared grip where your thumbs would rest. 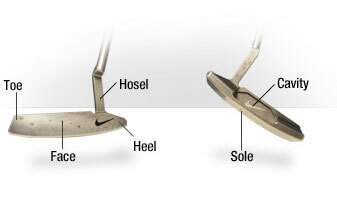 The club face on a putter is flat or nearly flat, and it's generally smaller than any of the other clubs in your bag. The putter is used when on the green (or just off of the side) to roll the ball into the hole. Blade Putter – These feature a smaller head style which is the most common and traditional style of putter head. Blades are used by players who prefer the smaller look and who are fairly accurate in their direction and distance when putting. Mallet Putter – These feature a much larger head style, and it is becoming more popular among all skill levels. Part of the reason for its rise in popularity is that the mallet putter head creates forgiveness on mishits because of its larger, heavier head. The weight of the clubhead is as far away from the face as possible, which stabilizes the putter head at impact, resulting in straighter putts. In order for your clubs to serve you in the best way possible, last for a long time, and look new longer, it is very important to keep them in good condition. These tips should help you in knowing how to care for them. Carry a towel when you play so that you can clean the club face off after shots. Clean the clubs after you hit balls at a driving range. While on the course, you can use a tee to clean out the grooves that the towel cannot get to. It can often be helpful to clean your grips with warm water and mild soap to keep them from getting slick. *The gap wedge typically has a 52° loft and is used to bridge the distance gap between pitching and sand wedge. **The sand wedge typically has a 56° loft and is often used out of bunkers and around greens. ***The lob wedge typically has a 60° loft and is used for high shots that spin a lot often to hit over obstacles such as bunkers. What’s In The Staff’s Bag? We interviewed some of our staff and asked what’s in their bag. They also offered some great golf tips. Putter: Odyssey Versa V-Line 35"
1 – Focus on taking one side of the golf course out of play consistently to improve your ability to navigate from tee to green. 2 – Establish a solid pre-shot routine for BOTH practice and play! 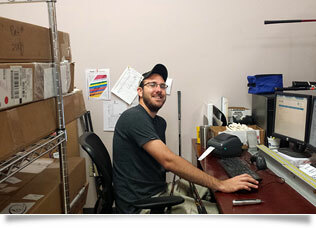 1 – It is always best to be fit by your local PGA professional before purchasing any clubs. 2 – Be honest about your game. 1 – Understand your strengths on the golf course and use them to your advantage. 2 – Golf is hard, but still a game – ENJOY YOURSELF! Par Men's/Par Ladies: On the far left you will notice that written in the second to last and last lines in the grey box are the words "Par Men's" and "Par Ladies'". These give you the expected number of strokes that a scratch golfer would get on the hole. The final numbers in that box are typically between 35 and 37. This is the total of the par numbers for the front nine added together. In the second grey box the same numbers are seen again after the back nine and then after that, typically a number between 70 and 74 is written. This is the total of the par numbers for both nines. Colored Boxes: The Tee Box will be listed usually as colors: blue, white, gold, and red on this particular card. Each color corresponds with the Tee Markers on the golf course. Selecting the proper Tee is crucial for both your and others' enjoyment of the game. It's important for your enjoyment because playing a course too long or too short is not fun. It's important for others' enjoyment because playing the improper tees can slow play, causing delays on the course. Within these colored boxes, you will notice very high numbers (in the 100s) running across the rest of the scorecard. These numbers represent the distance to the middle of the green from the respective Tee Box in yards. At the end of each 9-hole block, you will see the total yardage for that particular nine. You will see this again for the total for the full 18. Handicap: In the first line of the grey box on the scorecard you will see the word Handicap. This word is followed by the numbers 1 through 18. Each number corresponds to a selected hole on the course. The higher the number given in this row, the easier that particular hole is on average. This particular row ranks all the holes from hardest to easiest to give you an idea of what the hole is like for most golfers. 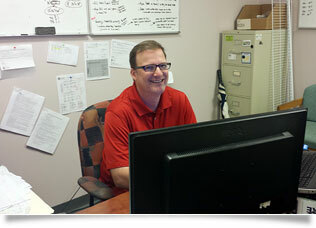 You will generally see even numbers on the Front 9 and odd numbers on the Back 9 for handicapping purposes. 90° Rule – a rule used on golf courses that states cart drivers must use the cart path until they are even with their golf ball, then make a ninety degree turns to go to their ball from the cart path rather than driving all over the course. Albatross – a score of three under par on a single hole. Birdie – a score of one under on a single hole. Bogey – a score of one over on a single hole. Bounce – the angle from the leading edge of the club to the lowest point of the sole of the club. This angle helps the club not dig into the ground. Break – the movement a ball makes on the green due to undulation. Cut – a large curve of the ball from left to right (opposite for left-handed golfers). Colors on Scorecard – the colors listed on the left hand side of the scorecard stand for the tees that you play from that are marked with the colors listed. Double Bogey – a score of two over on a single hole. Draw – a shot struck with the intent of curving the ball's flight slightly from right to left (opposite for left-handed golfers). Duck Hook – a violent curve of the ball from right to left (opposite for left-handed golfers). Eagle – a score of two under par on a single hole. Fade – an shot struck with the intent of curving the ball's flight slightly from left to right (opposite for left-handed golfers). Handicap – a number that represents the skill level of a golfer (the lower the handicap, the better the golfer). According to the United States Golf Association (USGA), the USGA Handicap System™ enables golfers of all skill levels to compete on an equitable basis. The weaker player may be able to deduct strokes based other the stronger players handicap. The actual handicap score is based on a complex calculation taking into account your golf scores, slope rating, and course rating. To see how handicaps are calculated, the official USGA manual is available here: USGA.org. A beginner, very unofficial quick way to come up with a handicap, would be to simply state how many strokes you average over 72. In other words, if you average 100 strokes per game, your unofficial handicap would be 28 (100-72). Hook – a large curve of the ball from right to left (opposite for left-handed golfers). Long Iron – an iron that is used to hit the ball a long distance. Mid Iron – an iron that is used to hit the ball a medium distance. Par – a score equal to the score expected on the hole. Scratch Golfer – a golfer who has a handicap of 0 and averages par of every hole. Short Iron – an iron that is used to hit the ball a short distance.